If you've built your Ark: Survival Evolved base around the volcano, you need to move it before the next patch. If you've played Ark: Survival Evolved you've probably either built a base on the game's dormant volcano, or toyed with the idea of doing so. If you did follow through on that construction, I hope you're not too attached to it, because the next patch (v257) is going to bring that volcano back to life. 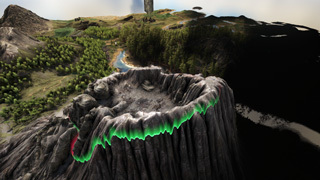 The change was announced in this post on the game's official forums, and was accompanied by the image above, which shows the area that the change will affect. There's also been a client patch that adds a green line to the game so you can see the area that will be affected. The v257 patch has pushed back to May 3, just to make sure that everyone has plenty of time to relocate their volcano bases. This date is only for PC players, but the post mentions that the change will "eventually come" to consoles as well. Best of luck avoiding the lava!